"Stop!" 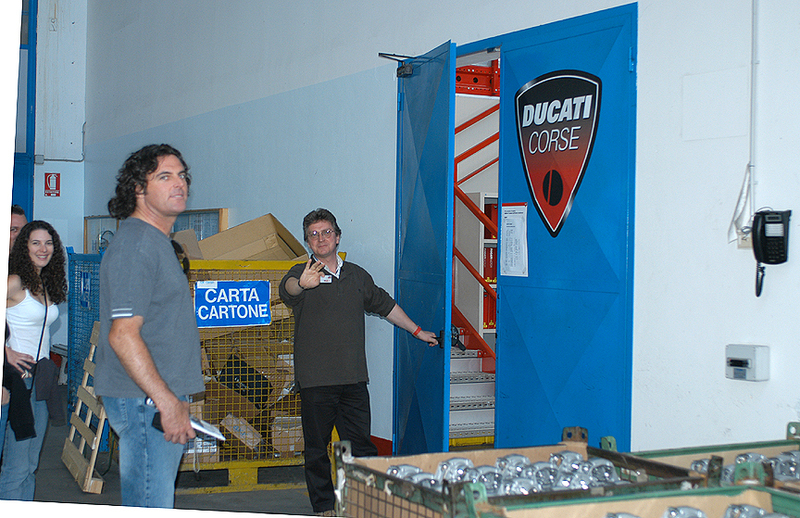 Ducati Corse Press Officier Julain Thomas forbids us to take pictures as he unlocks the entrance to the top secret Corse Race Department secured deep within the confines of the Ducati motorcycle factory. "Sure Julian, whatever you say...." Neither Julian or Cycle World's Brian "Cat Man" Catterson (left) knew about our consealed lipstick camera. Bologna, Italy, May 18th 2004 - It was a trip fo a lifetime. I was off to Italy on a 10 day paid dream vacation for any sportbike enthusiast, hidden behind the guise of "work". We started our weekend off at the nearby Monza World Superbike round on May 16th at the legendary and beautiful 101 year old circuit, then drove our rent-a-racer some 150 miles down the Autostrada to the Adriatic seaside town of Rimini for the Ducati produced World Ducati Week 2004 may 17-24th which proved to be one of the world's biggest manufacturer produced enthusiast events ever (only topped by Harley-Davidson with their anniversary gatherings in Milwaukee), and certainly THE BIGGEST for sportbike enhusiasts! Our ultimate sportbike trip to Italy for a World Superbike race and World Ducati Week wouldn't be complete without a visit Meca, or in this instance the Ducati Factory and Museum in Bologna, situated on the Autostrada hald way between Monza/ Milan and Rimini. But we couldn't stop there. 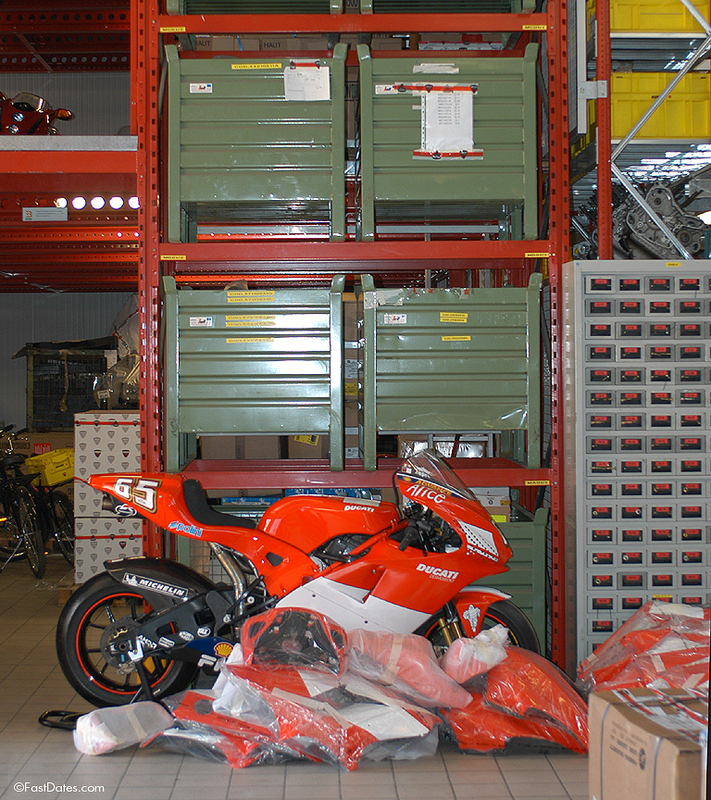 Could we get a visit to the top secret Ducati Corse racing shop, home of the World Championship winning Superbikes and race winning MotoGP machines? The Corse race shop is normally closed to everyone from regular visitors on the factory tour, to Ducati dealers, Ducati world wide distributors, employees and the press. But it was time to call in a few favors to our buddies, Ducati Cose Team Manager Paolo Ciabatti and Superbike Press Officier JulianThomas. The fact that FastDates.com is the biggest sportbike website in the world helped us get our foot in the door, but my providing our beautiful SBK World Superbike Fast Dates calendar girls to be the offical Ducati Corse umbrella at Laguna Seca each year probably had more to getting me in than anything else! 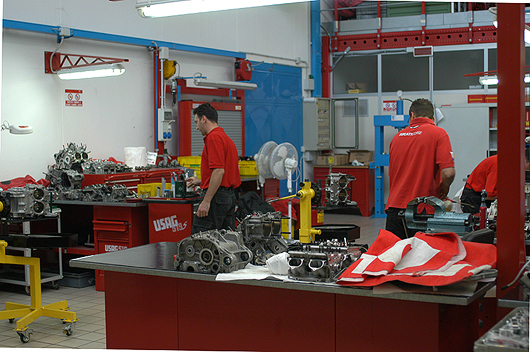 Desmosedici engines are scattered everywhere in the engine asembly area inside Ducati Corse. I was probably one of the first outsiders to see inside the exotic V-4 MotoGP engine. I picked up a huge piston from one of the engine s(complete with rings and wrist pin) that was only tall enought to hold the rings -with no real side skirts. It felt like paper, probably weighing about 4 ounces. I asked Julian if the piston wrist pin was make of titatium (because the assembly was so light). He replied, "No. it's aluminum." (!). That's how light a big 250cc displacement piston ßassembly on a titanium connecting rod has to be to turn 16,500 rpm. Below: This Corse engine technician is suspicious - Is that a camera in our pocket or are we just happy to see him? He felt better when we told him we were just excited to see so many exposed and naked Desmosedici. 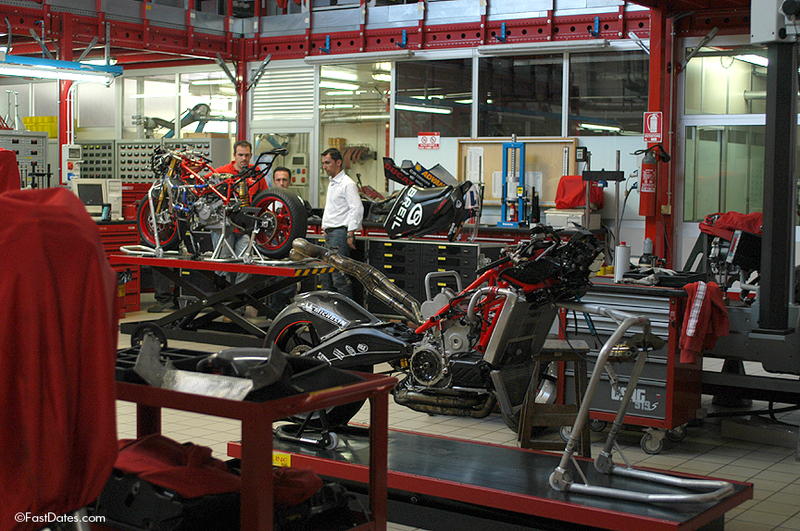 On our visit to the Ducati Corse race team shop housed behind locked doors in Ducati's Bologna motorcycle factory we only found the MotoGP team in residence. The expanded growth of the race team into MotoGP, together with increased motorcycle production in the factory, has forced the Corse Superbike team to move to a new building across town. 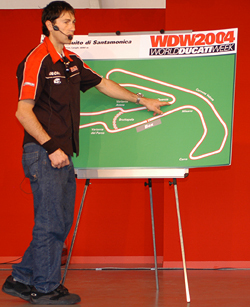 It is expected the MotoGP team will move to the new building as well by the end of the 2004 season as sales of new Ducati motorcycles continues to grow and more production space is needed at the main factory. On the particular day of our visit to the Corse Race Shop the MotoGP race team mechanics, bikes and the big 80-foot Corse race transporter were on their way back from a Monday test session at LeMans, France, the day after the LeMans MotoGP race weekend. Still, there was a fairly large crew of technicians in the Corse race shop building new and rebuilding used Desmosedici engines and MotoGP bikes. Later in the week both the Corse factory Superbike and MotoGP race teams and transorters with the rides and bikes would be set up and on display at the Misanotrack for WDW2004 where fans could meet the riders, mechanics and see the race bikes in person. With the riders also firing up the bikes and taking them to the track for demonstartion rides that had the fans cheering in approval. The Corse Race Shop area which is now devoted exclusively to MotoGP is about the size of 2 large high school auditoriums or basket ball courts, and uses a warehouse style modular steel upper floor level for additional parts storage. There is an engine building area separated by parts shelving, a bike building area, a large enclosed dyno room, and then a warehouse parts area with four levels of additional parts. 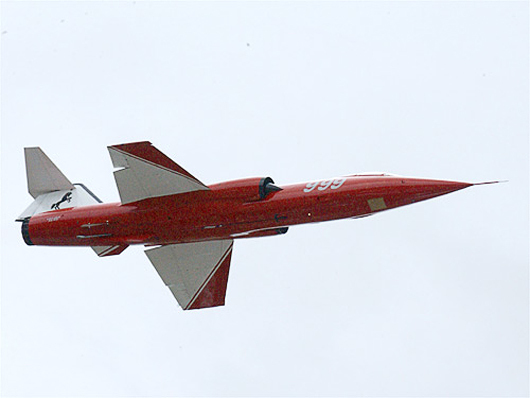 What we didn't get to see on this day due to the time constraints of also visiting the Ducati Motorcycle Factory, the Museum, and having lunch in the factory Cafeteria was the Corse Race Design Department which is all CadCam computer design aided. Or the areas in the factory where main components like the engine cases might be sand cast and CNC machined, and frames are fabricated. As is typical in many racing operations, many main components like carbon fibre bodywork, exhaust systems, swingarms and such are farmed out to subcontractors outside the factory. The dyno room is behind the glass doors to the side of the bike assembly room. You can see a second floor above with riders' leathers, wheels and body parts. During our recent exclusive tour of the Ducati Corse Race Shop in Bologna, Ducati Superbike Press Manager Julina Thomas told us the Ducati Corse race team had a budget this year of $32 million dollars shared between MotoGP and Superbike, with some 120 employees working in the Corse deparment. Thats out of a factory with just 1000 employees total who build around 40,000 motorcycle per year. "Obviously we don't sell enough motorcycles to justify our huge expenditure for racing," explained Julian. "Around 3/4s of our racing budget comes from our major sponsors like Marlboro and Fila. "Ducati will always be involved in World Superbike because we believe first and foremost in racing the bikes which we sell to the public and that means Superbike. 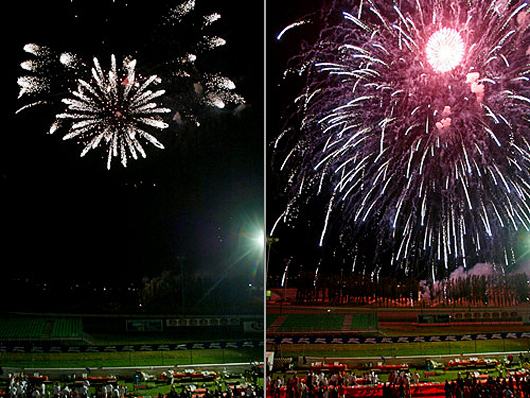 We are involved in MotoGP to elevate the name and image of Ducati in the world motorcycle market as an industry leader. And I believe this is what we are doing very well." If 3/4s of Ducatis $32 million dollar race budget comes from its sponsors, then the remaining $8 million dollars comes from the 40,000 bikes per year sold to customers which works out to just $200 per bike. A pretty good deal to own a pretty cool bike with the latest technology from a World Championship winning manufacturer. At the back of the race shop is a receiving area and more warehouse storage. Note the unassembled engines on the middle shelf. The MotoGP bike in the foreground is one of Loris Capirossi's 2003 season bikes now used for shows and exhibitions. 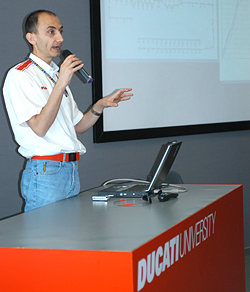 Where else but at World Ducati Week at the Misano race track a few days later could any sportbike enthusiast attend Ducati University and have Team Ducati Corse Director Claudio Domenicali (above left) explain the intimate design details of the Desmosedici MotoGP bike, or have World Championship rider Ruben Xaus (above right) explain the intricaticies of the Misano race track before you got to go out and ride the track. Awesome..